HSN was originally founded in 1982 as the Home Shopping Club and was the first company to introduce the concept of selling consumer goods and services on television. At first the Home Shopping Club was only seen on local television channels in FL, but in 1985 the Home Shopping Club expanded into the first national shopping network and renamed themselves HSN. Interestingly enough, this all happened way before companies such as Amazon and eBay made it convenient for people to shop at home via the internet. Of course, in 1999 HSN took notice of how popular online shopping had become and therefore launched their own website HSN.com. 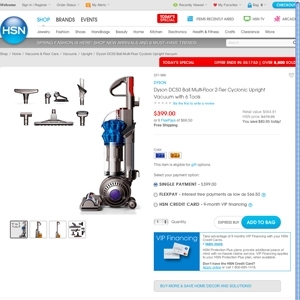 Today, HSN.com is one of the most visited websites on the web and rightfully so... With all the features found on the site such as the today's special feature, HSN TV feature, reviews, clearance section and more, there is plenty to do on the site. Hsn.com currently ranks #17 amongst sites offering online deals -- DinoDirect ranks #16. In the General Merchandise category, HSN ranks at #13 -- Dinodirect.com again ranks slightly higher at #12.